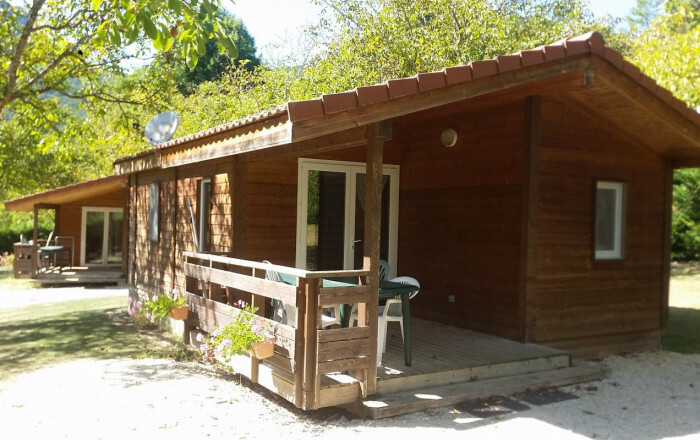 Six little chalets (4 to 6 people) in countryside setting with view of Le Glandasse massif, beside river Drôme in Romeyer, a little village 5km from Die. Many outdoor activities available (on water, in air, above and below ground), all within a few kilometres: Via Ferrata (assisted rock climbing), rafting, paragliding, hiking, climbing, horse riding, cycling, pot-holing. There's lots to do in the Diois all year round. Six detached wooden chalets (35 sq.m.) for up to 6 people. 1 chalet has disabled access. Each chalet has terrace, living room with open-plan kitchen (double sofa bed), 2 bedrooms (double bed) (two 80cm wide beds), bathroom, WC. Chalet rental includes use of swimming pool.